A couple of weeks ago I was at my mum’s house when she asked me to explain the concept of dark matter to her. I did, to the best of my ability, but her request got me thinking: stories about scientific research don’t always have a full explanation of the concepts in question, for good reasons, but maybe it would be good to have something to link to that does explain concepts in a bit more detail? So I decided to write this post, as a kind of experiment. It is intended to be a brief* introduction to dark matter, for my mum and anyone else that would like a bit more background information. 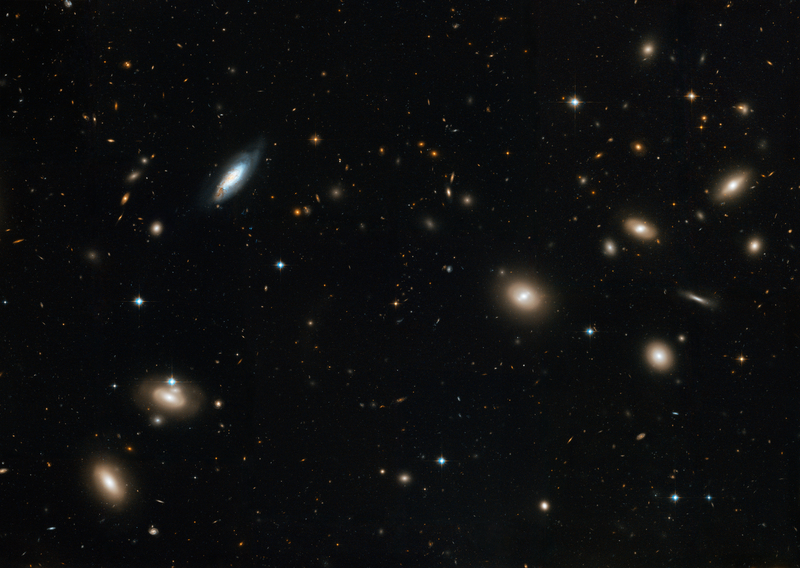 Coma galaxy cluster. Image: NASA. Large version here, but be warned it is really big. In 1937, a physicist called Fritz Zwicky worked out the mass of the Coma galaxy cluster and noticed that it did not match up with the amount of light coming from it. In fact, he’d worked out that there was a lot more mass in the galaxy cluster than its radiated light would suggest. This missing mass is what we now call “dark matter”, and it makes up 23% of the mass-energy density of the observable universe and around 90% of the total matter. It’s called dark matter because it does not interact via electromagnetic radiation (light). As you can probably imagine, this makes detecting it a rather hard task. All the experiments trying to directly detect dark matter are underground, to reduce the amount of background interference from cosmic rays. One of these detectors, the Cryogenic Dark Matter Search (CDMS), caused a bit of a fuss last year when some people thought it looked ready to announce a discovery. Unfortunately, it turned out that they didn’t see anything significant after all. The CDMS experiment is searching for weakly interacting massive particles (WIMPs). These are a class of particles that, as their name suggests, interact via the weak nuclear force and have mass. There are many possible WIMPs, but the favourite is the lightest stable supersymmetric particle – the neutralino. The neutralino is the superpartner of the neutrino, a particle we will meet later on as it is also a possible dark matter constituent. WIMPs are known as “cold” dark matter. This means that, when the large scale structures in the universe formed, WIMPs weren’t travelling very fast and would not have interfered with the formation of galaxies. Some other dark matter candidates are “hot”, meaning they would have been travelling at relativistic speeds in the early universe and could have ironed out any fluctuations in the matter density of the universe. The fact that there are galaxies in the universe today means these fluctuations cannot have been completely wiped out, which causes a problem if we want to consider these “hot” candidates. While they are the favourite candidates at the moment, WIMPs are not the only class of particles that could make up dark matter. In the rest of this post, I’ll detail some of the other contenders. Massive, compact halo objects (MACHOs) are large stellar objects that don’t give out light, and were probably named to contrast with WIMPs (you can’t say physicists don’t have a sense of humour). The “halo” in their title refers to the position that MACHOs occupy in a galaxy; the halo of a galaxy is a roughly spherical component that extends beyond the visible part, and is where most of the missing mass in galaxies resides. Unlike most dark matter candidates, MACHOs are made from the same stuff as you and me – protons and neutrons that make up ordinary atoms. This is useful because we know a portion of dark matter must be made from this baryonicmatter. MACHOs can be any non-luminous stellar object, including black holes, neutron stars and brown dwarfs. White dwarfs and very faint red dwarfs have also been considered, but these are not totally “dark” as they do emit small amounts of light. Because of their mass, MACHOs can be detected using gravitational microlensing – a method that looks at how light coming from a distant star has been bent by the object in question. Using this technique, limits have been set on the mass of individual MACHOs in the galactic halo of our own galaxy, the Milky Way. There are some disagreements between results from different groups (seehere for results from the MACHO project, and here for results from the Eros-2 project). However, overall, it has been found that stellar objects make up no more than a few percent of the mass in our galactic halo. This means that MACHOs can’t explain the whole dark matter problem. The most favoured hypothesis when it comes to non-baryonic dark matter, which we know constitutes the lion’s share of dark matter, is that it is made up of particles that were created in the early universe and were stable enough to survive to this day. Neutrinos are one such particle. They were produced in the early universe in similar numbers to photons, positrons and electrons and, as my particle physics textbook amusingly puts it, “they have the great advantage that they are known to exist”. It used to be thought that they were massless (meaning that they would be useless when it came to explaining the missing mass in our universe), but it turns out that they do have a very small mass. The problem with neutrinos as a dark matter candidate is that they are “hot”: they would have ironed out fluctuations in the early universe and prevented the large-scale structure that we see today. For this reason, they can only account for up to 30% of dark matter. Our search must go on. The final candidates are axions. These hypothetical particles were first dreamt up to solve a problem in Quantum Chromodynamics, the theory that describes the strong nuclear force. If they exist, axions would almost certainly have been produced in large numbers in the early universe. As a bonus, they fall into the category of cold dark matter, so would have posed no problems for galaxy formation. Some experiments are searching for axions, but as yet there is no experimental support for the axion model. It has recently been suggested that since the model may cause a bigger problem than the one it was invented to solve, the model should be scrapped. The future of the axion looks uncertain. At the moment we cannot say for certain which, if any, of these candidates actually make up the ridiculously large percentage of the universe we know next to nothing about. But physicists will keep on searching, and in the next few years maybe we’ll get a couple of steps closer to figuring out the mystery of the missing mass in our universe. * Ok, so it didn’t turn out quite as brief as I’d intended, but it still really is only a whistle-stop tour around the four main candidates. There are alternate theories I didn’t get chance to mention, including modified gravity laws and solutions in the form of quantum gravity theories. If you’re interested in reading more I’d recommend checking out this NASA page, and also this page by the Berkeley Cosmology Group, for starters. The one thing you forgot to mention, the most important thing as far as I'm concerned, is the possibility that dark matter does not exist at all. It could be nothing but a by-product of our means of detecting it. Remember that the only reason we have right now to believe that it exists at all is gravitational lensing. If gravity has some secrets we don't yet know, such as repulsion at long distances, or even the universe being attracted to something outside of it, then dark matter is no longer needed. In fact, the Modified Newtonian Mechanics theory (and others) dispenses with dark matter altogether. I prefer this approach so that we don't fall into the "ether" fiasco that embarrassed physics at the end of the 19th century.